By taking certain preventative maintenance measures you can keep your RV healthy for years to come. 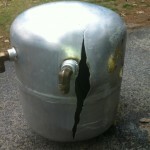 We’ve seen all too often the damage that can occur when proper care is not given to an RV. Here are some ways we can assist. The primary reason to winterize your RV is to protect the plumbing system from freezing. As water freezes and thaws, it expands with amazing force, destroying whatever confines it. This usually results in damaged pipes and tanks. At Tom’s RV Service & Supplies Ltd we use only premium, low-odor anti-freeze. Can’t come to us? Ask us about our Mobile Service. Our parts store has all of the items you will need to help your RV through the winter. We have a variety of moisture absorbers, sealants, trailer covers and more! Cracked or deteriorating caulking on your roof or exterior seams may allow water to enter into the ceiling and walls of your RV. 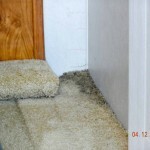 This can lead to extensive damage to your RV such as wet rot, dry rot, mold, and other water damage. We recommend that you check your roof and exterior caulking twice a year (Spring and Fall) and have your RV re-sealed, as needed. 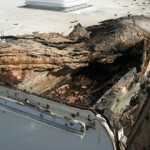 At Tom’s RV Service & Supplies Ltd we offer a free roof and exterior seams inspection. Don’t take a chance with your safety! It’s very important to have your brakes and bearings checked annually. At Tom’s RV Service and Supplies Ltd our technicians will conduct a thorough inspection and re-pack your bearings; keeping you and your family safe for your next RV adventures! Roof and interior seams inspection. For trailers and tow-along units only, pull two wheels for bearing, brake and suspension inspection.